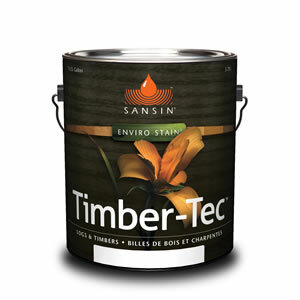 Why worry about surface discoloration and blue stain when you can protect cost-effectively with Sansin Timber-Tec? Nothing is worse than showing up on site Monday morning and seeing your beautiful wood has turned blue from staining fungi. Now there’s an easy, affordable way to prevent it – not only will Timber-Tec protect from UV degradation and repel water (helping your wood dry) but it will also mitigate wood discoloration during the construction process. Timber-Tec can be applied to green as well as seasoned timber, improving dimensional stability and allowing wood to adjust gradually to moisture levels in the environment. View the Timber-Tec C-20 and M-30 Product Data Sheet (PDF) for information about application, preparation, maintenance, and more. View the Timber-Tec T-40 Product Data Sheet (PDF) for information about application, preparation, maintenance, and more. View the Timber-Tec C-20 Safety Data Sheet (PDF). View the Timber-Tec M-30 Safety Data Sheet (PDF). View the Timber-Tec T-40 Safety Data Sheet (PDF).